Retroshift Now Shipping! Photo courtesy of Retroshift. “When I ride from my house, the nearest paved intersections are either two (headed west) or three (headed east) miles away. That limits the variety of my shorter rides. But I’m going to change it up in 2013, having fitted an old Fisher mountain bike with road bars and Retroshift CX2 controls. I’ll post Here’s a review on my experience with the shifters along Peoria County’s dirt-based (none dare call it gravel) Centerville Road soon. But first, I wanted to learn a little more about the Retroshift story. It’s a story that seems to include a human of British derivation named Adam Clement; however, after obtaining this interview over the Intertubes, I now fear for Mr. Clement’s safety. The reason? 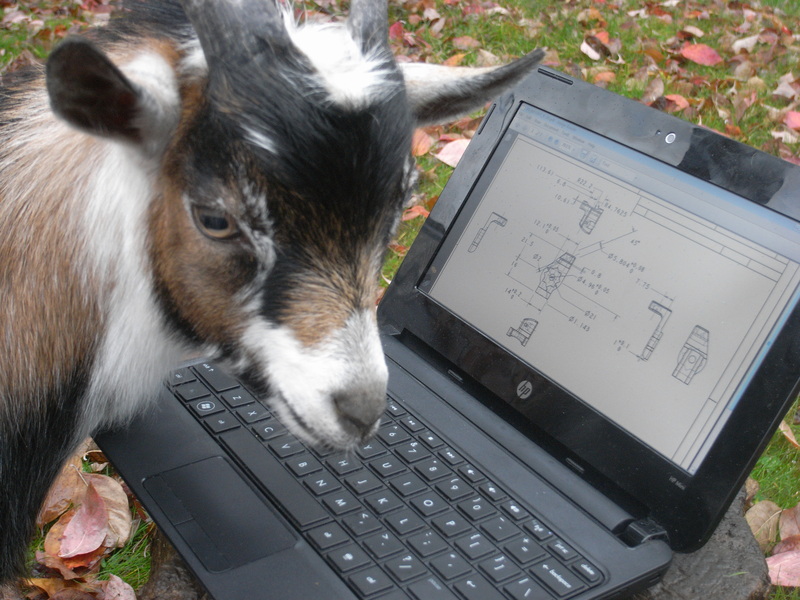 My mysterious Portland, Oregon, sources only identify themselves as The Goats. Obviously I’m not part of your core cyclocross audience, but I am a big fan of getting the full life out of otherwise outdated (or, at least, not enthusiastically marketed) parts. What kind of interest is there in the levers among people who don’t cyclocross? Our shifters are 100 percent aimed at CX, and all our time and fiddling goes into making them the best CX shifter we possibly can. That said, we know full well that over half of them are likely bought by gravel grinders, touring and commuters and for winter training bikes. We have NO issues with this as we are confident that if they work for CX then they will probably hold up just fine for anything else. We do not recommend them for aggressive road riding as for this shifting from the drops is of high priority. Our shifters do cause VERY divided responses; just as many people seem offended by them as love them. We are told this is actually a good thing, better than just being OK and boring! Most fun perhaps is seeing people who even think our shifters will not work actually try them and then find they can’t help but smile when they find out how well they do work. There are still some grumpy ones who are kinda mad that they do work, too! Has anyone connected with the business managed to make the business a full-time venture? Or are you all working as coffee slingers on the side? Marcus in engineering. Photo courtesy of Retroshift. At what point did you realize that you had a product with “some legs” to it? The big change happened when a distributor in Japan picked us up and promptly ordered up all we had and then some. We have some 40-plus dealers stocking our shifters in Japan now, and this was the main cause for us being out of stock from mid-March to mid-May in 2012. We do have sales from our web site, and a number of U.S. stores are contacting us each week, but we have not been stocked enough to actively market to the U.S. We hope to change this soon, however, as it is our preference for folk to buy from their local shops and so support them. It has been super watching our shifters appear in photos from races around the globe (and winning, too!). We mailed off shifters to 12 countries in the first three months of sales, which was a treat, as too was seeing blogs in strange languages excited about them. Locally, we have had a few riders testing/developing and a few wins this season, and two series won. Extra-special mention should go to Erik Tonkin who is a local pro (Kona team) and bike shop owner (Sellwood Cycle Repair) who really made people sit up and notice when he started testing them (and promptly won a Cat 1 race with them). How is the word about Retroshift getting out to the cyclocross community? Bike Rumor did a piece on the shifters when we were still in R&D after Tonkin had won. That post has about 30-thousand hits on it, which I am told is very high. That for sure got us going. You can read the comments to that and see just how polarized the opinions were. There is a follow-up post to when we started shipping and the comments improved. We also had a review done by road.cc in the UK who contacted us for a review set. They HATED them but it only seemed to help our sales, which was funny as we were of course disheartened by the review (which got a number of points wrong by the way). Still, all is good that is made good, and our product has changed much since that review. A better idea of the previous generation’s capability can be seen in the Cyclocross Magazine review. How great is it to see your product change the way people approach cyclocross? Not sure it can be said our shifters change the way people approach CX, but we do want this in a way. On one level we see our shifters as being a financially sound way to race to better results. By using a system that is considerably less expensive ($24 crash rebuild or replacement, for example), riders can spend less on their shifters and use the saved money on better wheels, which equals a faster bike! We have been contacted by a couple of “Ultra”-type gravel races like the Trans Iowa (300-mile race) as riders for this type of event are liking the durability and simplicity of the system. Bike Friday has started selling our shifters to customers for touring bikes, again for simplicity and reliability issues. We have also had two or three people with disabilities contact us who wanted an STI-type system that allows them to shift the rear derailleur with their left hand (as they are not able to do so with their right hand). This can be accomplished with a friction shifter. You’ve been at this awhile, and you’ve moved through at least one generation of the product. 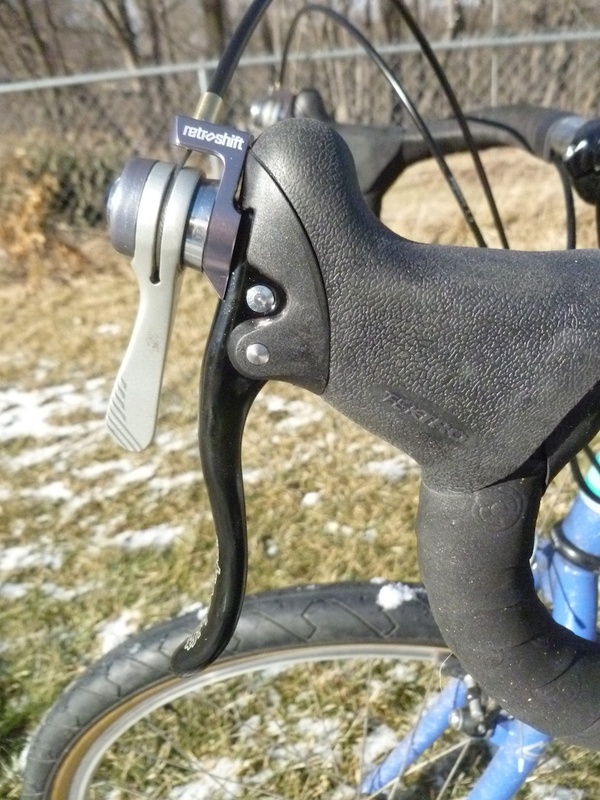 How close are you to saturating the market for shifters bolted onto brake levers? How close are we to saturation? I would guess maybe 0.05%–that might be a bit high! Really. For one thing, we are continuing to refine the system, so it is a moving target. There will be additional CX (and other) products on the way. It is interesting to note that 20 years ago bar-end shifters were near extinct. Today you can’t walk into a store without finding bikes with them. Progress! Bar-end pods that accept six through 10-speed down-tube shifters? I think these already exist. Take a look at the Rivendell site. Not something that we are pursuing in our quest to help humans race CX, however. 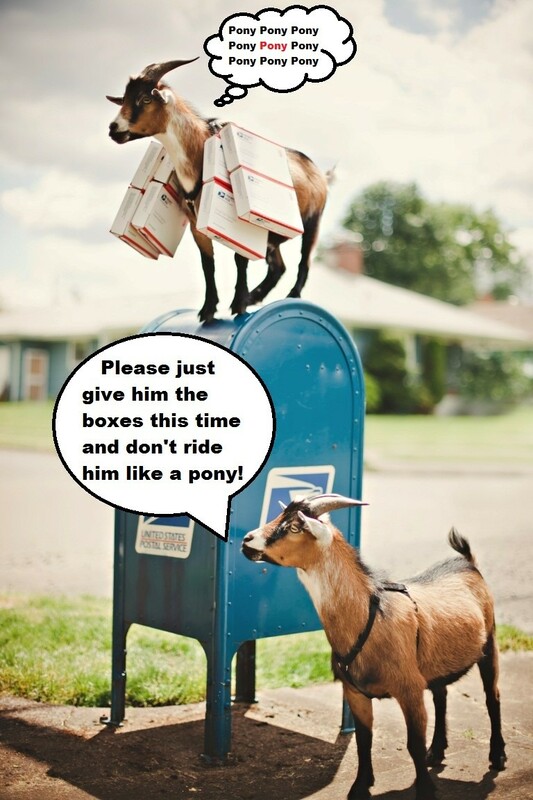 Editor’s note: By golly, the Goats are right. (Note to self: the Goats are always right.) I have got to get out of the house more often. Rivendell does indeed sell bar-end pods for its Silver levers, and it seems the pods should also accept several other shifters. Anybody out there tried them? Aside | This entry was posted in Business, Equipment and tagged cyclocross, dirt road, goats, gravel road, off road, Portland Oregon, Retroshift, shifters. Bookmark the permalink. Brilliant concept and execution. Hopefully you will not execute yourself in the trials of the system (although, you must not be late for the movie!). This particular blog makes me want to get down to the garage and get some grease on everything mechanical. Or, at least to unleash my incredible supply of handlebar tape (from it’s “Magical Plastic Box Storage Containers”. Go forth and torque, Lar. I’m guessing you’ve already read my road test: From the Top.